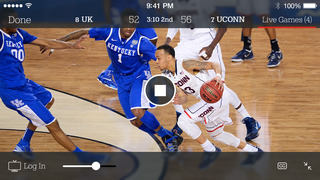 Watch every game from the 2015 NCAA® Division I Men’s Basketball Tournament live on your iPad, iPhone, and iPod Touch. With NCAA® March Madness® Live, you have all the best rivalries, upsets, and buzzer beaters right at your fingertips anytime, anywhere. Log in with your TV provider to enjoy unlimited access to live streaming video of all 67 games across TBS, CBS, TNT and truTV. A temporary preview period is available for live game streaming before login is required. ◆ Watch live streaming of all 67 games (paid TV subscription required for games broadcast on TBS, TNT and truTV; 3 hour live video pass available prior to logging in; CBS games do not require a paid TV subscription). ◆ Follow up-to-the-minute scores and stats, and explore the tournament with the interactive bracket. ◆ Immerse yourself in the tournament with analysis, best storylines, and classic March Madness moments. 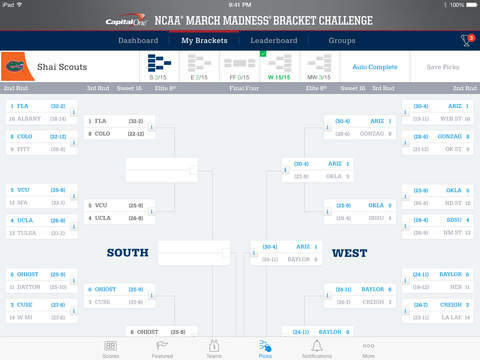 ◆ Make your picks in the official bracket game of March Madness, the Capital One NCAA March Madness Bracket Challenge. ◆ Satisfy your team fan loyalties, learn about the Cinderellas, and research your bracket with the all-new team pages. 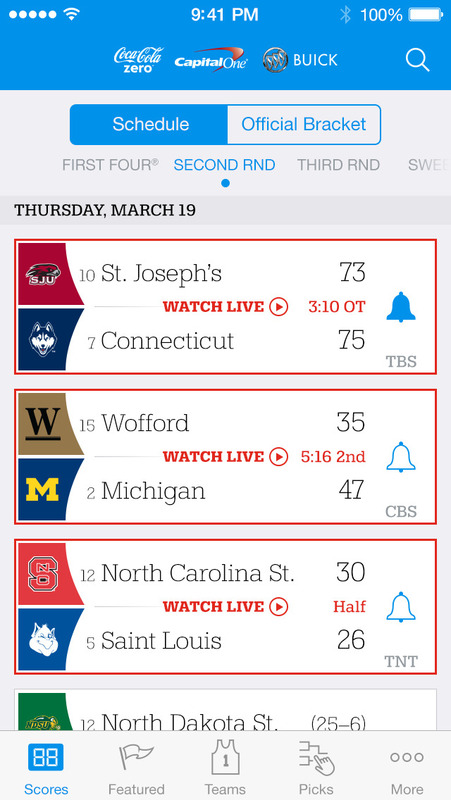 ◆ Receive live game notifications for upsets, overtimes, close games, and your favorite teams. ◆ Play the all-new NCAA March Madness Tournament Run game presented by Capital One. ◆ Experience the best of social media, from Twitter to Instagram, in the Coke Zero Social Arena. ◆ Enjoy team-specific live video streaming during each of the National Semifinal games at the Final Four. ◆ Track and share key moments including the most memorable video highlights, photos, and tweets. ◆ Updated for the 2015 tournament with a refreshed look and feel. ◆ NEW: Satisfy your team fan loyalties, learn about the Cinderellas, and research your bracket with the all-new team pages. 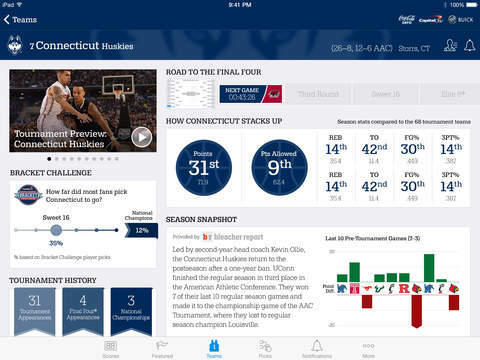 ◆ NEW: Featured section allows fans to discover the tournament’s best storylines and relive classic March Madness moments. 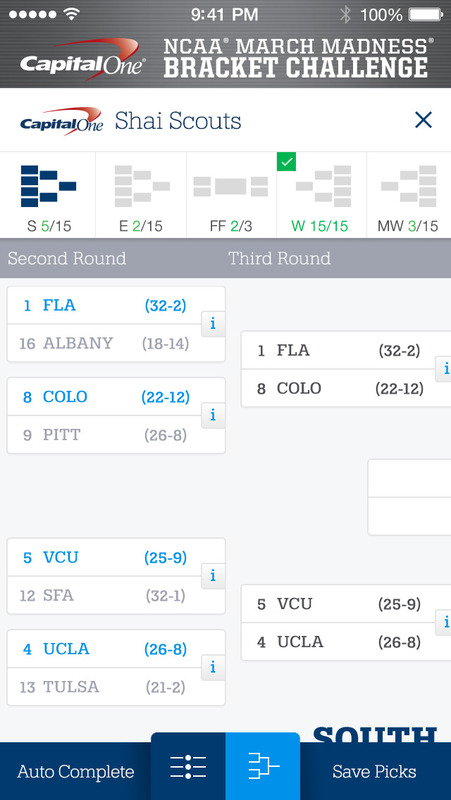 ◆ NEW: It’s never been easier to make bracket picks on your phone. Choose between list view for quick picking and bracket view for that timeless look and feel. ©2015 NCAA | Turner Sports Interactive, Inc. All rights reserved. LongTwit HD - "Convert text to image for Twitter, Facebook & Weibo"